This is certainly another hint where Sony will want to compete in the near future. Box.net now gives Sony 50GB(!) 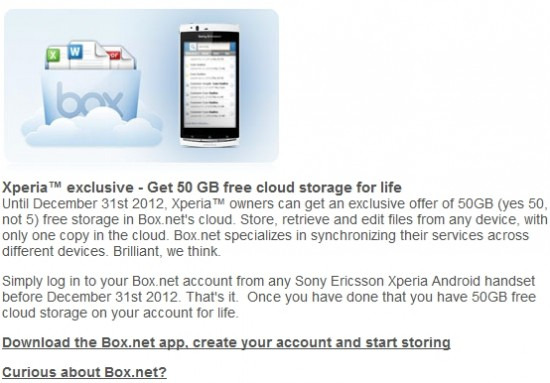 free cloud storage when registered on your Xperia-device by Dec.31, 2011. Interesting and a nice gift from Sony and box.net. And it shows that the cloud will be the topic at Sony, too. No doubt about that anyway, but they mean it. This is a big plus for Sony users, as they now can store music, docs and every kind of data in the cloud. Seriously, for the rest, we now need GDrive finally. On mobile and desktop. What are you waiting for, Google? Christmas?